A simple activity such as lifting a bag of groceries the wrong way can cause a serious spinal fracture if you have osteoporosis, also called brittle bones. An estimated one-third of women and one-fifth of men will suffer a fracture related to osteoporosis in their lifetime, according to Dianne Daniels in “Exercises for Osteoporosis." Regular strengthening exercises targeting the spine from your neck to lower back can help prevent bone loss, relieve stress on your bones and build muscle strength to reduce your risk of a fracture. Sit up straight in a chair with both hands on top of your thighs. Place one hand on the back of your neck, just below your head. Gently press your head back into your hand using your neck muscles. Stop your head from moving using your hand. Hold the position for three seconds and repeat. Sit slightly forward in a chair with your shoulders relaxed and arms by your side. Tuck in your chin and bend your arms at your elbows. Slowly bring your arms backward as you straighten your back and pull your shoulder blades together. Repeat the exercise three times. Lie on your back with a pillow under your head, knees bent and feet on the floor. With the ends of a resistance band in each hand, straighten both arms above your chest. Keeping your elbows straight, slowly pull one end of the band toward your side as far as possible. Pause and then slowly release the band and repeat the exercise with the other hand. Lie on the floor on your stomach with your arms straightened in front of you. Press both hips into the floor and gently lift your right leg and left arm at the same time. Hold the position for five seconds, then repeat with the other leg and arm. To increase the resistance of the exercise, use wrist or ankle weights. Kneel on the ground, knees and feet hip-width apart and the palms of your hands on the floor. Slowly raise one leg, keeping your knee bent, until it reaches the height of your buttocks. Hold the position for five seconds before gently lowering your leg. Repeat with the other leg. Lie on your back, knees bent, hands by your side and feet flat on the floor. Tighten your abdominal muscles and gently lift your pelvis upward so that your back is flat against the ground. Hold the position for five seconds, then repeat. Lie on your back, with your arms by your side and legs extended in front of you. Raise your legs gently and place them on a stability or exercise ball so that your feet and calves are resting on the ball. 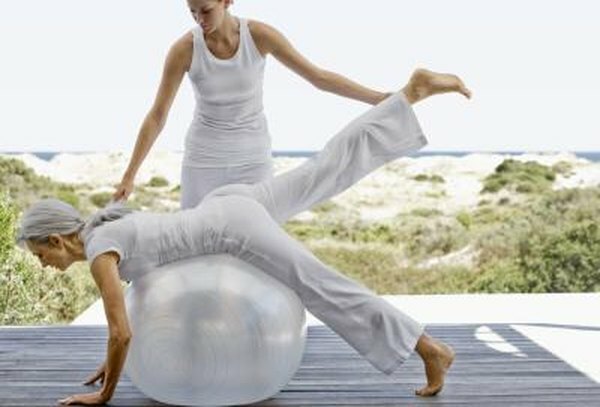 Tighten your abdominal muscles and slowly lift your hips off the ground. Lift your hips as high as possible before gently lowering them. If you have osteoporosis, you can benefit from weight-bearing activities such as walking, plus stretching, balance and posture training in addition to strengthening exercises. Consult your doctor before beginning any exercise routine, and to discuss how often to exercise. Avoid any exercises that involve heavy lifting, bending forward, quick twisting motions or reaching downward. These motions put additional stress on your bones, which may lead to a fracture. Osteoporosis Canada: What Types of Exercise Should I Do?